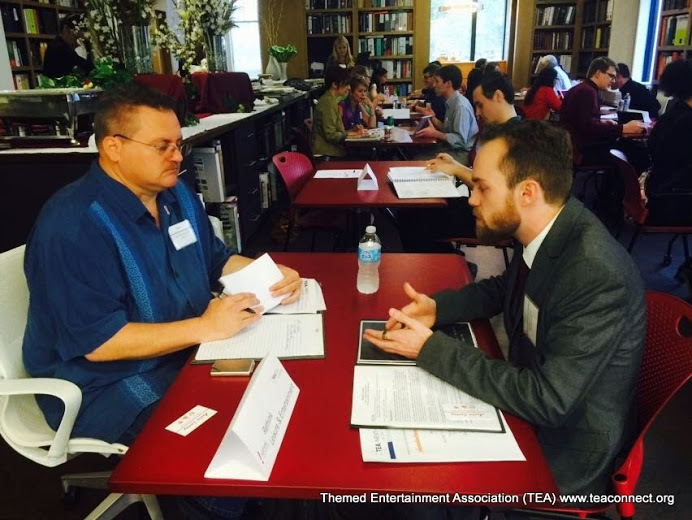 Burbank, CA, USA (April 8, 2015) — The Themed Entertainment Association (TEA) cultivates students and young talent through its NextGen initiative. 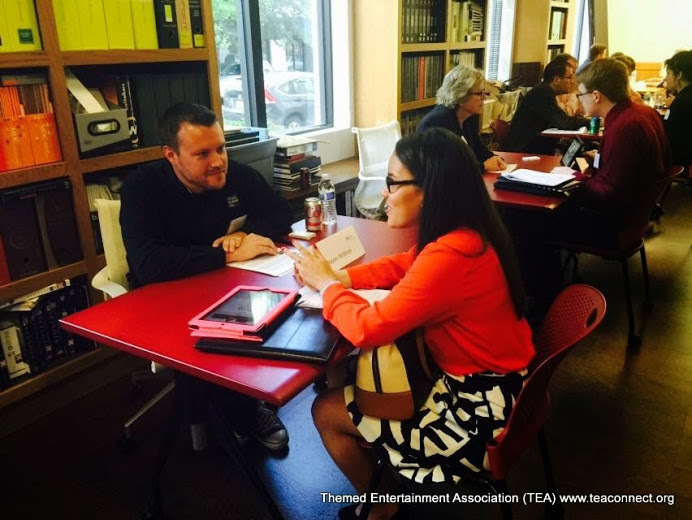 Activities include TEA GibGab, a speed networking event bringing together TEA NextGen members, who are college students or recent grads – with TEA member companies looking for new hires. Professional development takes place through a series of tightly scheduled, brief interviews and a group question-and-answer session. A TEA GibGab event enables up to 36 candidates to present themselves to as many as 18 different companies, in fields ranging from design and media to engineering and AV, from economics and project management to theme park operations, master planning and more. At TEA GibGab East, April 2 in Orlando, Florida, sponsored by and hosted at the offices of VOA Associates, with additional sponsors FUNA International and Nickelodeon, TEA NextGen Committee Chair Clara Rice of JRA reported that several attendees traveled to Orlando specifically to attend the event, including from as far away as Colorado and Montana. “Now that’s dedication!” said Rice. Some will likely find work as a result of GibGab, as has happened in previous years. Rice said, “In speaking with participating companies afterwards, many think they found good matches.” In addition to VOA, FUNA and Nickelodeon, participating companies were Acomb Ostendorf & Associates, Adirondack Studios, AECOM, Alcorn McBride, Birket Engineering, Busch Gardens Tampa, Electrosonic, exp, Luce Group, nth Degree, Rethink Leisure & Entertainment, Themeworks and Universal Creative. The support of dedicated volunteers and sponsors is invaluable to TEA programs and events. In addition to those mentioned above, key TEA GibGab volunteers include Andrew Hansen, Anne Huang and Daryl Le Blanc (VOA), Tito Soto and Laurel Van Patten (Rethink), John Paul Guerts, Kirsten Cobb and Patrick Kling (Nickelodeon), Ken Kalish (FUNA), Jennifer Kinsella and Jovon Eberhart. TEA activities of this nature are taking place around the world – in the Association’s Europe & Middle East Division and Asia Pacific Division, as well as its Eastern and Western North American Divisions. They include outreach to academics as colleges and universities develop themed entertainment curricula, and the formation of TEA@University clubs; mentoring programs, webinars and opportunities to volunteer at TEA conferences. 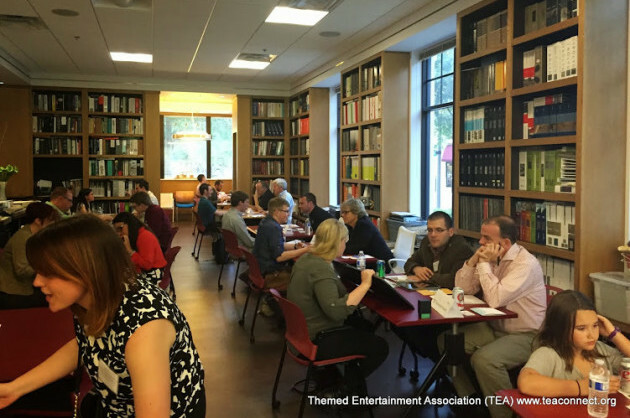 TEA’s annual SATE conference (Storytelling + Architecture + Technology = Experience) in September is traditionally hosted on a college campus to make the most of the Association’s growing international dialog with students and the academic community.